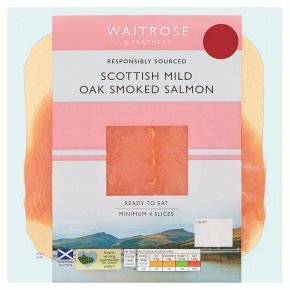 Premium quality salmon farmed in the fast flowing, deep tidal waters around Scotland. Cured using salt and demerara sugar, then oak smoked giving it a soft, mellow flavour. INGREDIENTS: salmon (Salmo salar) (fish) (97%), salt , demerara sugar.